Sonos SUB wireless subwoofer joins multiroom music system | What Hi-Fi? Sonos has launched its first subwoofer in the form of the wireless Sonos SUB. The SUB simply requires mains power in order to connect wirelessly to any of the Sonos range of amplified components. So that's the CONNECT:AMP, PLAY:3; PLAY:5, ZonePlayer 100 and ZonePlayer 120. It doesn't however work with the non-amplified Sonos CONNECT, ZP80 or ZP90. The Sonos SUB launches on 19th June and will come in a high-gloss black lacquer finish for £599. A black matte finish will be available in October and cost £499. You can stand the SUB up or lay it down flat, and the cabinet is made from proprietary resin that promises acoustically dead walls. Measuring 40.1 x 15.7 x 38.1 cms and with a weight of 16.5kg, it's certainly fair manageable compared to the average subwoofer. The subwoofer uses two force-cancelling speakers positioned face-to-face and has dual acoustic ports to "maximise acoustic volume... and enhance bass resonance". Two Class D digital amplifiers deliver the power, while all filter settings and DSP circuitry is taken care of inside the SUB, which promises a "clear, deep, all-digital sound" according to John MacFarlane, CEO, Sonos. 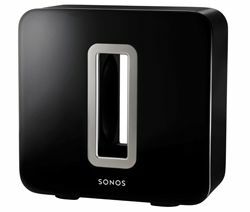 We have a sample winging its way over to us as we write, so look out for the whathifi.com review of the Sonos SUB very soon. In the meantime you can check out the Sonos YouTube preview video of the new SUB.